Start Your Successful Podcast Journey the Right Way! Chill Digital Marketing / Business / Start Your Successful Podcast Journey the Right Way! Chances are good that you have listened to a Podcast, or have at least heard a friend talking about them. 40% of Americans over 12 say they listened to a podcast in 2017. 24% say they have listened to one in the past month. This growing format presents a great way for your business to reach and engage with an audience in new and relevant ways. The main reason for starting a Podcast is to reach an audience that prefers their content via audio instead of reading. Listeners are able to access them on almost any device in convenient locations, including the car, gym and even at their office. 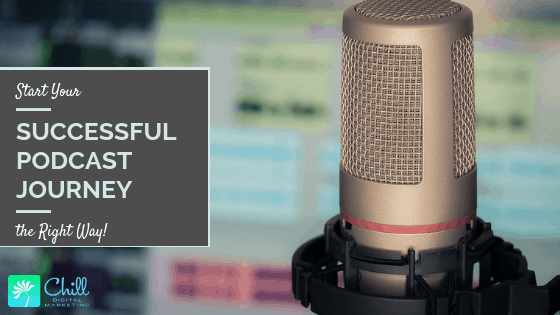 By developing a relevant Podcast, you can become an authority in your field. This in turn will attract listeners seeking your content and your business offerings. By taking a few simple steps, almost anyone can get their message out there and gain a following. With the popularity of the format on the rise, you can be part of the trend as it is taking off. By speaking on a topic you will attract others interested in that topic. You can create a community that will want to invest in your brand. Podcasts allow you to speak your two cents on a topic you are passionate about, and to have a place in the conversation. Consider the format and theme of your Podcast as well as how to make your Podcast stand out in your field. It is important to expand on a specific topic and make it broad enough to be interesting and creative to tie listeners into your niche or expertise. In picking a format, whether it be solo, interview, and making sure it has a consistent time limit, your listeners will come to know what to expect. Even if you don’t think of yourself as a thought leader, by taking a chance and speaking to others who share your interest, you just might spark a positive thought that will influence people in the field you are speaking about. Make sure you are being thoughtful by engaging listeners, but also realizing you may resonate with people in ways you didn’t even realize. Come up with a name to make your Podcast stand out. Also, develop artwork that is associated with your show. Sometimes, the art and name will be the only chance you get to have people give your Podcast a try. People should get an idea of what’s inside just by a glance at your Podcast, that will draw them in to see what it’s all about. Encouraging ratings will help your Podcast to gain notoriety and to increase in popularity with positive reviews. Logistically, the main thing you will need to start your Podcast is a microphone. Make sure you have audio recording software and if you want better quality, invest in more expensive equipment to increase sound performance. Having headphones for interviews, as well as an external audio recorder help to have a backup for your sessions, in addition to the direct mic. You will need to have an editing tool to crop your recording and add an intro, outro, or other breaks. There are free and paid software that can have varying results, many with simple drag and drop functionality. Finally, hosting your Podcast on a platform like iTunes, Stitcher, Spotify or Soundcloud, will allow listeners to stream, download and share your content. You can grow your Podcast audience by rewarding listeners. With consistent, relevant content, you will hopefully get a fanbase that will spread the word to others and continue to grow your show. This will allow you to eventually sell space to advertisers and sponsors, in addition to promoting your own services, which will hopefully convert to increased revenue. 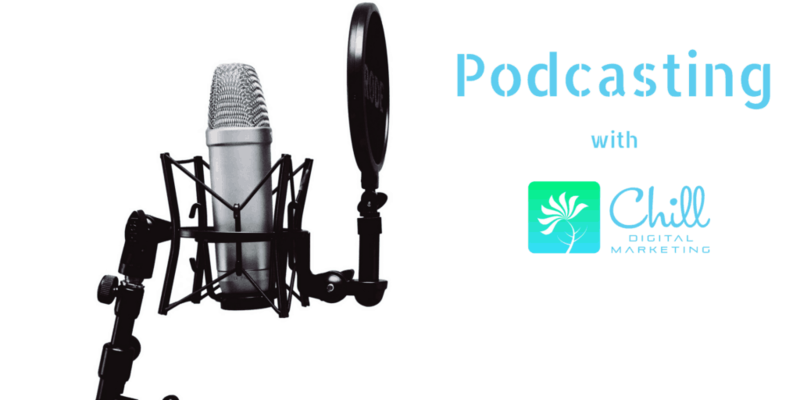 Be sure to embed your Podcast on your website and blogs, and share it via social media and newsletters. In addition to hosting on a reliable platform, you can distribute your Podcast via an RSS feed. Keep listeners interested by encouraging interaction, running contests, and taking questions or having an interactive format with them. You can even broadcast your Podcast recording live to your followers, allowing fans to get the inside scoop on your latest recording. The main thing you can do is experiment with Podcasting and getting comfortable in front of a microphone as you try different techniques to find your groove. Podcasting is on track to continue to grow as a popular media method for years to come, and having one will be important part of a marketing strategy. 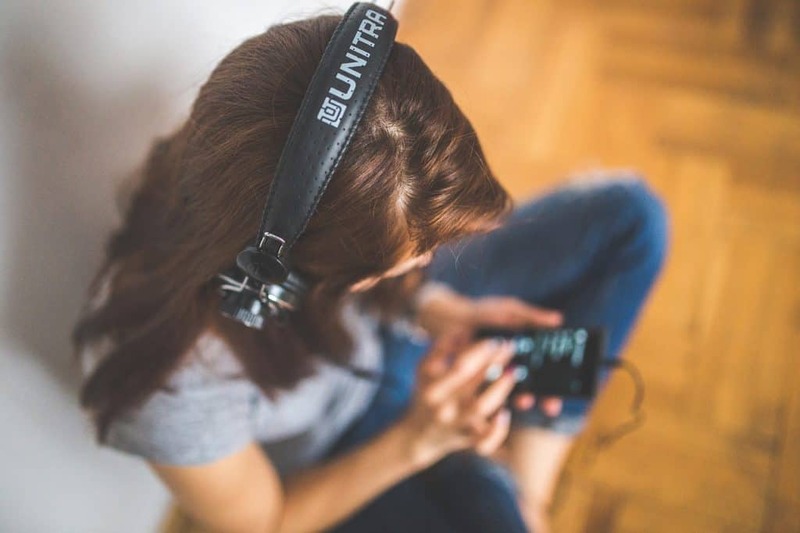 If you are in the metro Denver area, you can get more help in starting your own Podcast by signing up for our Podcasting Basics workshop which has frequent listings.